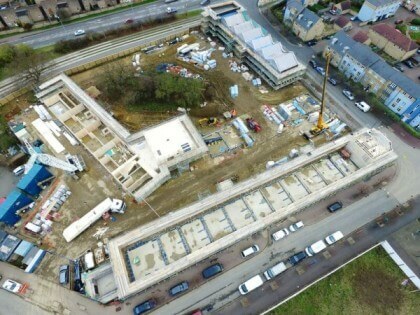 We’ve teamed up with K1 Cambridge Cohousing to provide their members with mortgages for the homes at Cambridge’s first ever cohousing community. Currently being built at Orchard Park in the north of the city, the energy efficient and low impact ‘Marmalade Lane’ collective custom build development includes 42 homes ranging from one bedroom apartments to four bedroom homes and will be ready from June 2018. We have a proud history of backing community-led housing projects, including housing co-operatives, housing associations, community land trusts as well as cohousing schemes. The homes are being built to the equivalent of the Code for Sustainable Homes Level 4 (CSH4) energy standard and will be eligible for Ecology’s innovative ‘C-Change’ sustainable homes discount for the lifetime of the mortgage. Marmalade Lane, designed by Mole Architects, is being delivered by TOWN, a UK developer and custom-build enabler, in partnership with Trivselhus, a Swedish building company specialising in innovative low-energy closed timber panel construction. Cambridge Cohousing’s members have customised their homes inside and out to meet their needs from a wide range of configuration options. Triple glazing, high levels of insulation and air tightness and mechanical ventilation with heat recovery will make the homes comfortable, minimising heating requirements and helping to keep energy bills low. Renewable energy will also be provided by air-source heat pumps. The members of the multi-generational cohousing community at Marmalade Lane will share the intention to live in a more sustainable way. The energy-efficient terraced houses and low-rise apartments will be built around a shared-space street and large communal garden. The shared facilities feature a common house, where community members can regularly eat and meet together, as well as meeting rooms, a laundry, a play room and three guest bedrooms. Find out more about the K1 Cohousing community. Find out more about Ecology’s community-led housing mortgages. An early repayment charge may be payable if all or part of the mortgage is repaid within the first two years.